It’a Autumn here in the UK and a mighty fine time to go camping. Especially if the days are cool, crisp and bright, allowing you to get miles under your feet if you’re backpacking in the camping sense of the word or if you’re using a campsite as a base for either work or exploring a particular area. It’s great when it’s like this, but if it’s raining, then it’s not so great. I love camping in the Autumn and spent around six weeks doing so in the Dales when I first moved down to Yorkshire. It was a cold October and I was pleased to have a good tent and a few good sleeping bags around to deal with the colder conditions (it was a fluke that I’d been asked to do a three season sleeping bag review for a climbing magazine, so the bags were given a good run for their money!). I’ve had wet weekends in the Lakes and a spectacularly wet week in Norway when it rained every day until the one where I was leaving Voss behind and heading back to Bergen for the flight home. It is possible to pack light to deal with such conditions. There’s loads of lightweight kit out there – tents, tarps, sleeping bags, sleeping mats, stoves, cookware, plates, mugs and cutlery that can deal with most eventualities. Some are reasonably priced and readily available whilst others are aimed at more niche markets such as mountain marathon usage. I’ve used tents by Terra Nova, The North Face, Crux and Macpac, packs by OMM, Berghaus and POD, sleeping bags by Terra Nova, Rab, PHD, The North Face, Anjugilak and Snugpak and stoves from MSR, Primus, Coleman and others. All of my stoves are gas ones – simple and reliable. Sleeping mats have ranged from a 36 year old Blaxmat to a good ol’ Karrimor Expedition foam mat to self inflating mats from Therm-A-Rest, Gelert or Millets. Cookware on carry everything trips is usually a small Tefal pan set (there’s a larger one for car camping), the mugs are Aladdin insulated ones and cutlery can be from Spork or MSR depending on whether I’m going for plastic stuff or titanium (good, but a bit more expensive…). The plates? 4 for £1 in Tesco’s end of picnic season sale! Cooking tools have come from GSI or MSR – cutting boards, folding spoons or spatulas etc and the sharp knife is either a Swiss Army Knife in the UK or whatever blade I can pick up cheaply and ditch elsewhere – I’ve had a pack sliced open before when someone in an airport decided to open up my bag to take a look inside it and didn’t do a good job of repacking it afterwards… I did get a new pack out of the airline though! Water bottles are either Nalgene or Platypus and as I’m more likely to be filling these in lower risk areas, I use sterilising tablets or droplets to clean up any water taken out of streams. The roll-up Platypus bottles come in useful whilst travelling too and the Nalgene items can be used to rehydrate food on the move too. Camping food is whatever I can get from a local store before heading off. I don’t read or speak Norwegian, but even I can understand what to do with the local version of a Pot Noodle or open a can and scoop tuna into said noodles or empty a can of burgers, hot dogs or other identifiable fodder into a pan and warm it through. Yes, I did use the word can there. Although I use some dehydrated foodstuffs and bags of wet rations that can be eaten cold or heated up, I still carry cans around, largely because of something that resonated with me when reading accounts by Hamish Brown of his walking exploits here in the UK. His reasoning for taking cans was that the weight of carrying canned food was offset by the amount of stove fuel that could be used to ensure that dehydrated food was heated up and cooked though properly. My use of cans is also down to student days as canned food is much cheaper than specialised fodder and the portion sizes are usually bigger too. As ever, the ubiquitous travel towels are packed too, but not a comb or brush as I usually get a number 4 cut before heading off on a trip – dries quickly and needs no maintenance! Clothing choices depend upon the conditions I’m likely to be facing and apart from what I’m wearing, there’s usually two spare base layers in the bag, two pairs of undies, two pairs of socks, one of trousers and a pair of Ronhill Tracksters – great for mooching around in or for use in the sleeping bag on cooler nights. What you take along and pack is up to you. There are those who pack as light as they can for trips, even if it’s not a mountain marathon. My own choice may surprise you as it’s what is appropriate for the trip and the conditions likely to be encountered. I’ve spent 36 hours in a Gore-Tex bivvy bag or a battened down the hatches tent when the weather’s changed and slept in a survival bag when a thunderstorm hit and it would have been a daft move to start playing with metal tent poles. So I pack for the unexpected! If you’ve read Packing Lists below, you’ll have noticed that there is no ideal packing list to follow, largely because of the variables between each trip and your own foibles when it comes to packing. Caroline and I have different approaches when it comes to packing – she will pack the day before (unless she’s on shift) and do the whole lot in one go. For the most part, my packing list for a week away is about the same as it is for a fortnight and it would also be applicable for a trip lasting a month or more. It’s not far removed from the contents of the bag in the car when I first moved to Yorkshire – and based myself in a tent on a site near Skipton for the first six weeks down here. On that occasion, I had to pack both work clothes for the store I was managing at the time and casual stuff too. It was also early Autumn, so some cool weather clothing had to be considered, as did stove, pans, food, a three season sleeping bag and a decent semi-geodesic tent. If it’s an overnight or a weekend trip in a hostel, guest house or hotel then the bag is either an elderly Lowe Alpine 20L climbing pack or a large – 15L – Healthy Back Bag. Clothes are usually what I’m stood up in with a spare t-shirt, dress shirt and spare socks & undies in the bag. The trousers are usually a dark colour and made from a fabric that can be sponged clean if they’re splashed with drips of gravy, bolognese, chilli or curry sauce or have been attacked by low flying red, red wine. Travel jacket is usually a decent waterproof with a hood in the collar. This has been an ultralight one in the past, but both have just died last year (after about five-six years of hardish use) and have been replaced with slightly heavier duty ones by Berghaus and The North Face. The Berghaus RG Gamma is a longer length jacket that suits smarter places while The North Face Resolve is a shorter, more casually styled jacket. If it’s cool and likely to be dry, then the waterproof jacket is swapped for a soft shell, typically an Elixir lightweight soft shell by The North Face or one of the same brand’s discontinued heavier models that has a hood attached to it. If it gets really cold and is dry then a down or Primaloft filled jacket is used instead. I’ve not had too many problems with wet down jackets, but there are now some down items around that can resist wetting without having to resort to the use of a heavier waterproof shell on the outer surface as a means of resisting damper conditions. This combination of different clothing works well, because it’s invoking layering principles to keep you comfortable, warm and dry. The more layers you wear, the warmer you are as air is trapped between each of these layers. As the air warms up, you feel that little bit toastier. If it’s a week, fortnight or longer away, the rule of threes starts to apply for the contents of a slightly bigger bag such as the Osprey Farpoint 40 I’m using at the moment. Three t-shirts, socks and undies (one to be worn next, one washing and drying and one that’s clean and ready to air) go in the bag along with a spare pair of trousers, spare shoes, boots, Crocs or sandals as appropriate. There’s a minimalistic wash kit – hotel stuff’s used for showers etc if it’s provided rather than using my stuff – and there’s a large and a small travel towel in there too. The travel towels are obvious, but, as I’ve mentioned before, they also come in useful when it’s clothes washing time as damp clothing can be rolled up inside a towel to get moisture out before being hung out to dry. Personal meds are included along with paracetemol, indigestion tablets and a few sachets of recovery powder. All are for my personal use as I’m aware of the legalities of handing meds over to someone else to take – Caroline’s a nurse and even she takes her own paracetemol with her in case she needs some. The BIG disclaimer here is that you should respect ALL medications and be fully aware of the medication’s properties, dosages and potential side-effects or pitfalls. I’ve had to deal with overdoses during my days of helping to look after a student hall and they’re not pretty sights… Let common sense prevail at all times (the joy of doing liability law as part of my degree course…)! As I’ve mentioned before, we’re not big on taking tech things, but we know a few who do. Some have even packed their tech stuff before realising in the departure lounge that they need a guidebook for the place they’re heading to and that it may be a good idea to tell their bank that they’re leaving the country for three months or more! A book or a Kindle’s fine for us – Caroline packs a smartphone, I don’t. And let’s face it, it’s not that long ago that smartphones, tablets or netbooks didn’t exist! So what do we pack when we go camping? That’s the subject of the next post! You can ponder the subject forevermore, but whilst there are many suggested packing lists out there on the internet and in guidebooks or ‘how to’ tomes, there is only one that counts. And that’s the one you need to write for yourself as you plan any kind of visit, be it a night away from home, a couple of weeks in the sun, a trekking venture or a circuit of the globe. If you’re booking a walking or an adventure travel holiday as a package deal, you will inevitably get a packing list sent to you, but in some cases, I’ve seen packing lists with less than helpful advice on footwear for example. If on the other hand you’re heading off on an independent trip then the onus is on you to sort out what to take with you before you even book your travel ticket. Do you need a big bag with you for the trip that you’re proposing? Or will going hand luggage only be a better idea that will save you some cash which will pay for a couple of night’s accommodation, a couple of train journeys or a few meals out? Keep the bag small and light enough and you may even avoid the departure gate pack-size crate of added charges or any weight penalties. It’s all about doing your homework and getting the balance right about what you need and what you think you need. Will it be t-shirt weather? 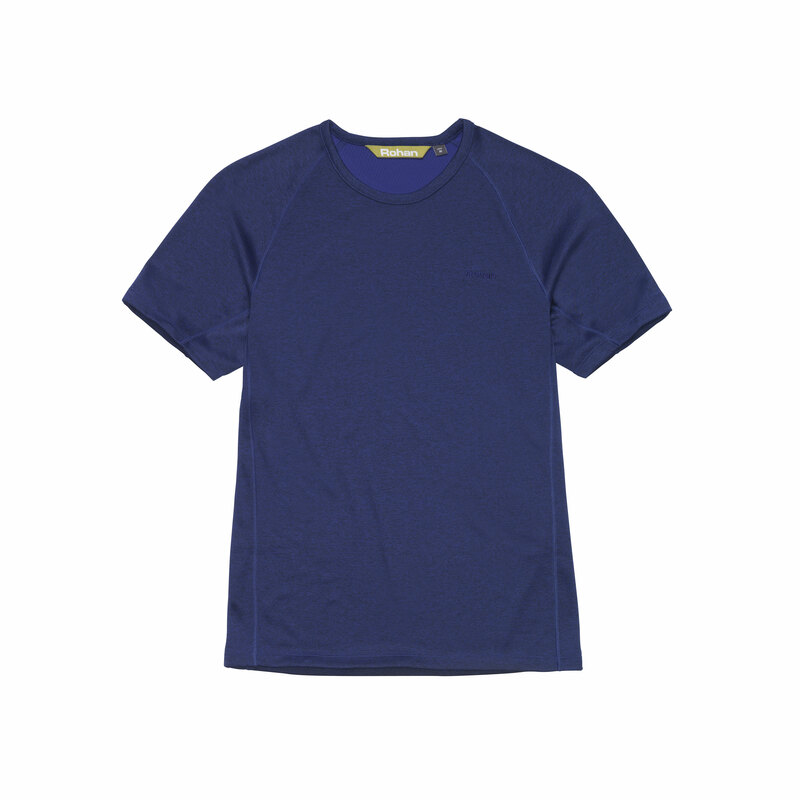 SPF shirts? Base layers? Fleece? Down? Soft Shell? Waterproofs? An umbrella? Shorts? Jeans? Techno trousers? Soft Shells? Capri Pants? Ronhills? Are there likely to be any local considerations about covering up in temples etc? Or dress codes in the kind of accommodation you’re likely to be using? Can you wash & wear in your digs as you go along or do you need a launderette? 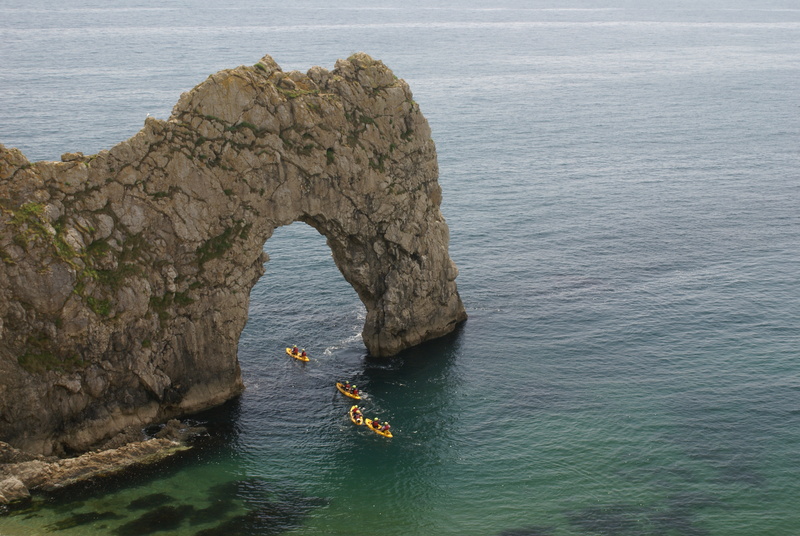 Are you likely to be taking part in any specialist activity that you’re interested in? Can you hire any specialist kit locally? And will the clothing that you’re thinking of taking along be suitable for any activity? What kind of terrain are you likely to be covering and will your footwear choices be appropriate for this kind of terrain? Boots? Shoes? Sandals? Flip Flops? Crocs? Can you get shower gel, shampoo, contact lens solutions, paracetemol, aspirin, ibuprofen, deodorants, sun cream, after sun, razors, or batteries? Or repeat prescriptions while you’re on the road (a potential minefield as what can be prescribed in one country may be frowned on in another). Or replacement specs when your best pair breaks and you’ve forgotten to pack a spare pair? Top tip? Always pack a spare pair (especially if you’re a contact lens user) and a copy of your most recent prescription. And just how much tech are you taking with you? Interesting pointers came to my attention recently when I read a 2013 Wanderlust interview with esteemed travel writer Paul Theroux – ‘Never carry anything that needs a battery’ and ‘Leave the camera at home”. Yes, it’s a big set of considerations to put into the melting pot, but doing the research and putting together a list helps you to make decisions that are appropriate to you and the trip that you’re undertaking. And that’s without mentioning any paperwork that needs to be taken with you on your journey. There’s a few hints on older posts here on wisepacking that may give you some further pointers, but remember, it’s my opinions and hints that are on here and you may or may not agree with them. Which is fine, because everyone’s different. Booked in advance – Pousada do Infante, Sagres. Posh, but rather good (and they did discounts for those over 55!). 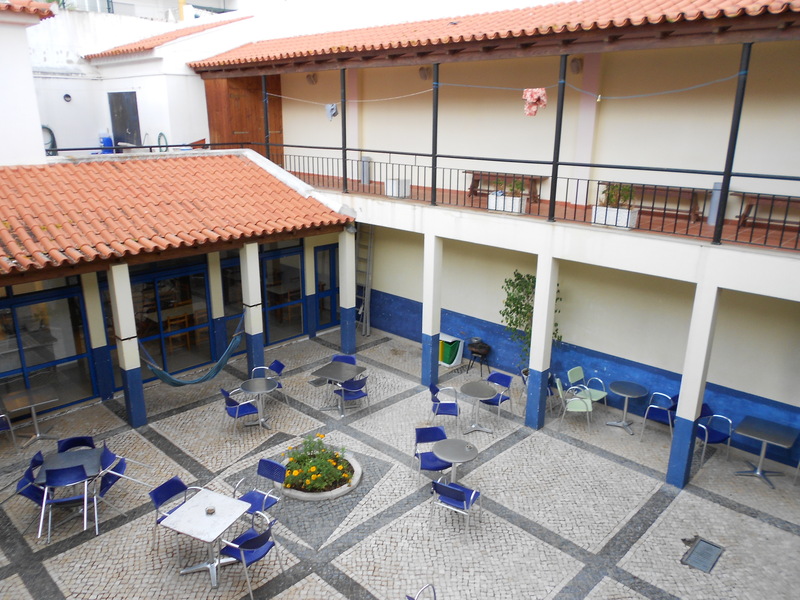 Booked on the road – Pousada de Juventude, Lagos. Basic and a bit like UK hostels used to be (no bad thing that!). 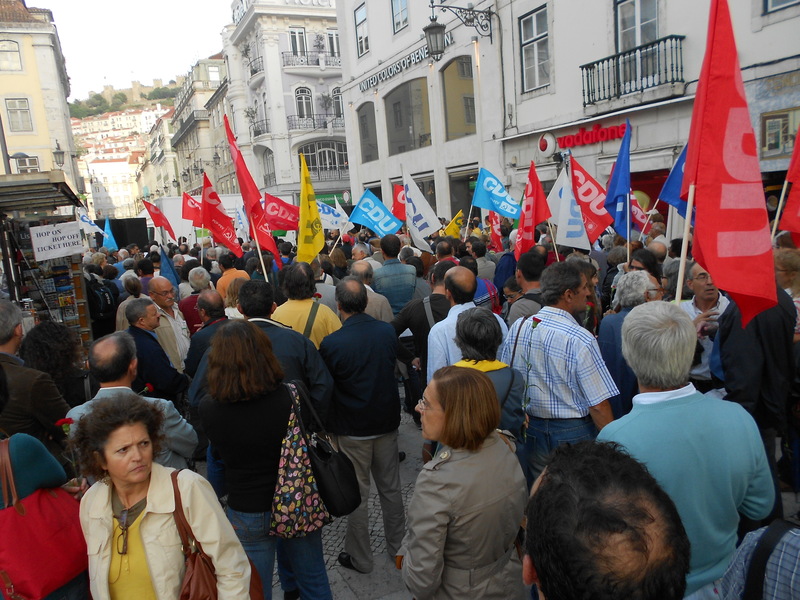 Political demonstration in Lisbon city centre on a Friday afternoon. Lots of views, but no aggravation at all. It’s been interesting to see how many people go onto travel forums expecting others to come up with suggestions or even a full itinerary for the person that’s posting on the site. Laziness on the poster’s behalf? Yep… and a lack of imagination too if poster can’t be bothered to think of a country or area to visit. The other good one is posting a long list of places to visit in a ridiculously short time scale rather than thinking about it and doing their own homework about what can be achieved, seen or visited in that time scale without spending hours on buses or trains. As I’ve mentioned before, I’ve headed off to foreign climes at two days notice when the weather here in the UK turned inclement. Or hit the hills around Mayrhofen after booking a week’s half board in a three star two weeks beforehand. Or planned road trips around the Norwegian Riviera and the area south of Lisbon at six weeks to six months in advance of the trip taking place. Planning a trip isn’t that hard to do. Yes, you can get a package deal, but you may be paying over the odds for that privilege. There’s a host of printed material out there from Lonely Planet, Rough Guides, DK, Berlitz and others to help make up your mind as to where to go in the time allocated to the journey and the initial budget for the trip. Most of the posters on the forums mentioned earlier have been advised to forget about using the internet by self and others in the early days of planning their trip and hit a library, book shop or charity shop to get a paper guidebook or two (or three if there’s a 3 for 2 offer on the go) and read it to get an idea of what’s on offer, what the guidebooks have in the way of suggested itineraries or what’s feasible at the specific time the trip is likely to take place. When you’re reading the book or books, it’s worth having a notepad and some Post It Notes by your side to make notes of places, accommodation, activities and travel modes that appeal to you or to mark any interesting facts that you’ve found in the book. If the book is mine, then I also have a fluorescent highlighter pen to mark up items of interest. I’ll undertake those same processes in a rival’s publication and then compare and contrast what’s said about towns, cities, attractions and hotels, guest houses, posh gaffs or hostels. If a place is mentioned in two or more guides, then I’ll investigate further and that’s where the internet comes in, especially when it comes to booking the flights and the first and last night’s accommodation. Places of interest are investigated as are festivals or any events that could impinge on travel or accommodation availability over the period that I’m likely to be in the area. Another pointer to consider is whether you’re making the trip on your own or whether your partner or a friend is going along too. It’s great to do your own thing, but if it’s not your partner or friend’s thing then Houston, we have a problem. When I’ve done some reading up, Caroline is encouraged to read through the guidebooks as a way of getting her thoughts and preferences on where to go and what to see or do. Compromises may be made in the loose planning of the trip or even on the day – if Caroline wants to visit somewhere that doesn’t interest me, then she goes into a gallery, museum, cathedral or church to see what it’s about and I’ll go and have a coffee, a beer or just sit and read until she reappears. Simples! When it comes to using the internet for research, then it’s a good idea to have specific questions in mind when posting on forums as a means of gleaning advance information. This could be about first or last Metro journeys to the airport, availability of ATM’s, medication, vegetarian or vegan food if it’s not mentioned in a guidebook, the cost effectiveness of travel passes or whether a car hire or tour company is worth doing business with. There are times when you get some real berks or right trolls adding their ‘comments’ to the equation, but for the most part, fellow travellers will help out wherever they can to give others the benefits of their collective experience. Some may have visited your destination recently or may even be there at the moment as either a visitor or as a resident. Once done, then it’s time to do that loose planning. Have the basics and the aspirations sorted before you head off, but leave time and space to go with the flow and to make things up as you go along, especially if things don’t go to even the loosest of planning. We had to sleep in Lisbon Airport last year before an early check-in for our flight back to the UK. We’ve spotted Norwegian news bulletins about fires on the main Bergen-Oslo railway line and ended up dodging political demos too. We’ve also found some gems too – cafes, restaurants, attractions or views just by looking at local noticeboards or by simply wandering around. It all adds to the fun and to the overall experiences! But once that loose planning is done and you know roughly where you’re going to go and what you may or may not be doing, there is once thing left to do – draw up your packing list. Which is where the first of next week’s postings may come in handy! When Caroline and I were looking for travel packs last year, there were a couple of contenders. 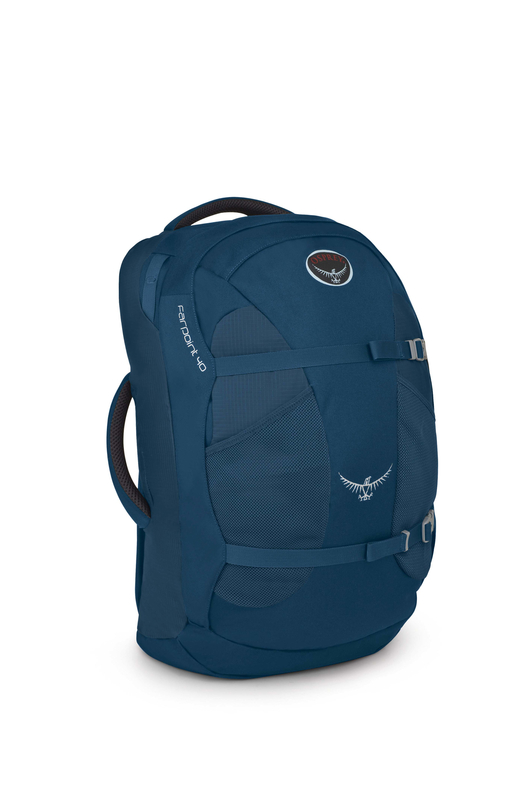 At the time there was a lot of chatter about carry-on luggage on Lonely Planet’s Thorn Tree Forum and the name of the Osprey Farpoint 40 kept cropping up, so I investigated. The size and capacity of the Farpoint 40 matched the criteria I was looking for and whilst I would have preferred to have bought it in a bricks & mortar store, I couldn’t find a local stockist that had one in at the time… so I hit the internet. As I’d been used to getting packs through the post to test for a variety of magazines over the years, I was used to trying on and assessing packs from cold rather than trying on as many as I could before making my mind up and prising the card out of my wallet. 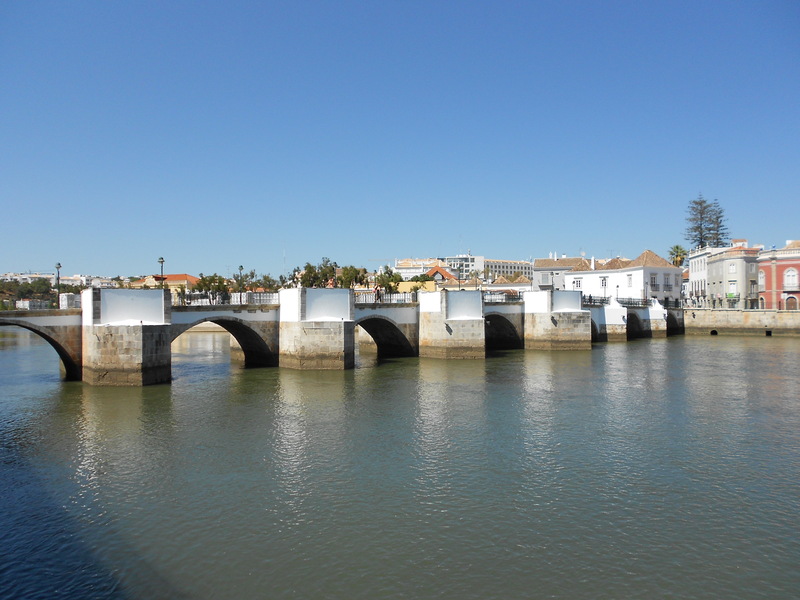 Both of our Farpoint 40 bags proved themselves a few weeks later – two weeks in Portugal travelling hand luggage only on TAP Portugal who have an 8kg carry on weight limit. 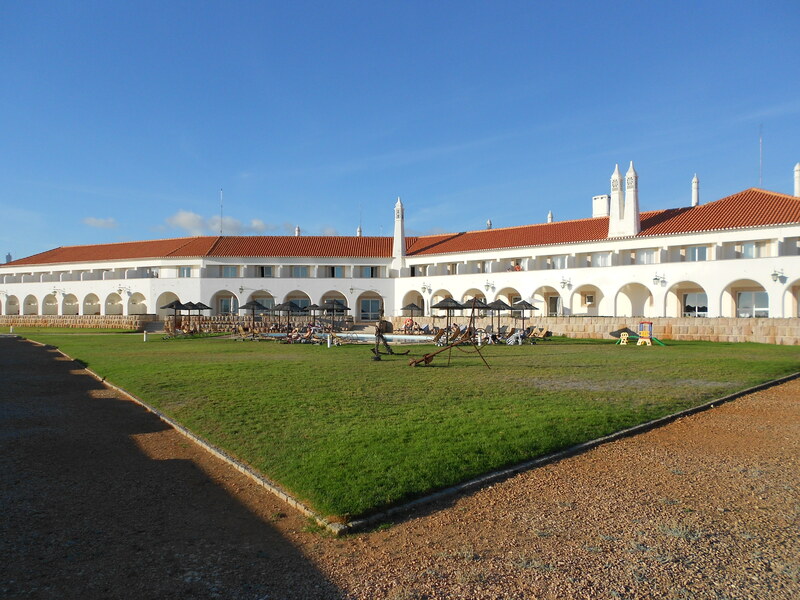 As the trip involved a mix of accommodation that included guest houses, small hotels, pousadas and hostels, we had to pack accordingly in order to kind of stay in the expected dress code for the pousada nights in Sagres. End weights? Caroline’s bag came in at 6kg, mine at 7kg (I had the guide book and the charges/adaptors for our Kindles, cameras and Caroline’s smartphone). The beauty of the Farpoint 40 is down to the care and attention that’s been put into the design and construction of the pack. The back panel unzips and rolls away to reveal a pack harness with adjustable shoulder straps, hip belt and chest strap (that incorporates an emergency whistle). The main section opens to reveal a space that takes enough wash & wear clothing plus a spare pair of footwear to last a weekend, a week, a fortnight or longer. Compression straps are fitted to cinch in the contents of this section and there’s a large zipped mesh pocket to help keep worn and unworn clothing separate from each other. The flap on the front of the pack opens to reveal a laptop or tablet sleeve that’s both zipped and padded, an organiser pocket behind this that can be used for paperwork, notepads or sketch books whilst the space in between this tech sleeve and the pack’s outer surface can be used to stash snacks, guidebooks, tissues, suncream or body sprays for use during the day. On the outside of this section is a top pocket that I’ve used to hold my liquids bag, my meds bag, my camera and my keys before heading into airport security. Once there, it’s a simple matter to place these in a tray for examination and X-Ray and to put them back afterwards. Also on the outside of the bag are two mesh bottle pockets and two compression straps that can help with the bag’s packed sizing, a useful measure in the event of being faced with an airline’s pack size cage at check-in or the boarding gate. Caroline’s version of the Farpoint 40 is a slightly later model than mine as hers has a removable shoulder strap to help carry the bag without opening the back panel to use the main harness. There are however good grab handles on the top and one side of both of our bags, allowing for easy pulls out of overhead lockers or a coach’s cargo bay. Both of our bags were easy to shoulder and walk with last year, a factor that ensured that we only took one cab during our time in Portugal for example. All we did when we got off a bus or train was to reveal the harness, sling the bag over our shoulder and walk. Organising the contents in each bag was easy using the compartments and the pockets. As we don’t carry too much tech, the padded sleeve came in useful for paperwork filing – papers such as plane tickets, hotel confirmations and travel times or maps were in the sleeve whilst the polythene folder with the older stuff or the papers to use later in the trip were stored behind that sleeve. I also used a set of Rohan packing squares to provide a bit more organisation to the proceedings. Do we like our bags? Oh, yes. So much so that they’re also used when we’re heading off at home too. They’re packed and then slung in the back of the car. The size and capacity of the Farpoint 40 bags ensure that we’re not overpacking for a week away as we have found out that less can be more… and that concept works too! The price? UK price is £80. Osprey Farpoint 40 image courtesy of Osprey via Spring PR – thanks! I don’t know why, but for some reason, the subject of bucket lists appear to have come to the fore over the last week or so. There’s been comments on various websites about them, there’s a listing on the Kindle store for The Unique Travel Bucket List by Danielle Renner (just bought it at lunch time and am a few ‘pages’ into the book at the moment) and there’s even been a mention of bucket lists on a repeat episode of NCIS too. Do I have a bucket list? Kind of, but it’s not as long as it used to be, largely because so many things have been ticked off over the years that just happened and were never planned too far in advance. I’ve managed bands, I’ve photographed a few rock acts and have interviewed a few singers, musicians, actors, writers and comedians for a variety of magazines. I’ve been filmed photographing Madness, reviewed films in print and on TV (thankfully that show is not on You Tube – I’ve checked! ), I’ve been seen on The Tube watching The Smiths during their last appearance on that show and been deafened for four days by a certain metal band who shot a video whilst playing at Newcastle City Hall (you’d need some pretty good software to find and see me). As far as travel goes, I’ve got to most of the places that I’ve wanted to get to. I’ve had to rule a couple of places out for health reasons though as I can’t go diving after having a collapsed lung a few years ago and suspect that heading to the Himalayas may cause problems too after that collapsed lung and stroke ten years ago. I’ve headed to Norway a few times now (11 to be precise) in the Spring, Summer, Autumn and Winter. I’ve seen The Northern Lights over a stave church at Lillehammer, looked down over Bergen harbour after dark from the top of the Floibanen and headed out on cross country skis around Geilo, Trysil, Beitostolen and Lillehammer. Yet I still want to go back there. Plans to take a Reliant Robin up to Nord Kapp came to nothing about twenty years ago (don’t ask! ), but I want to show Caroline what Norway’s like in the winter months. I also want to get up to Trondheim and above as we didn’t get up there last time we were over there. And I’d also like to head up the coast on the Hurtigruten service at some point too. I’ve been to Iceland and want to head back there as well. It’s a while since I last visited, but there’s unfinished business across there. Two weeks wasn’t enough to explore that country properly, even though I had a hire car at the time. Places were missed or left behind after too short a stay, so I’d like to spend a month over there from mid-September onwards. Plans are already afoot to go back to Portugal. Not for an activity holiday, but to relax, unwind and explore. 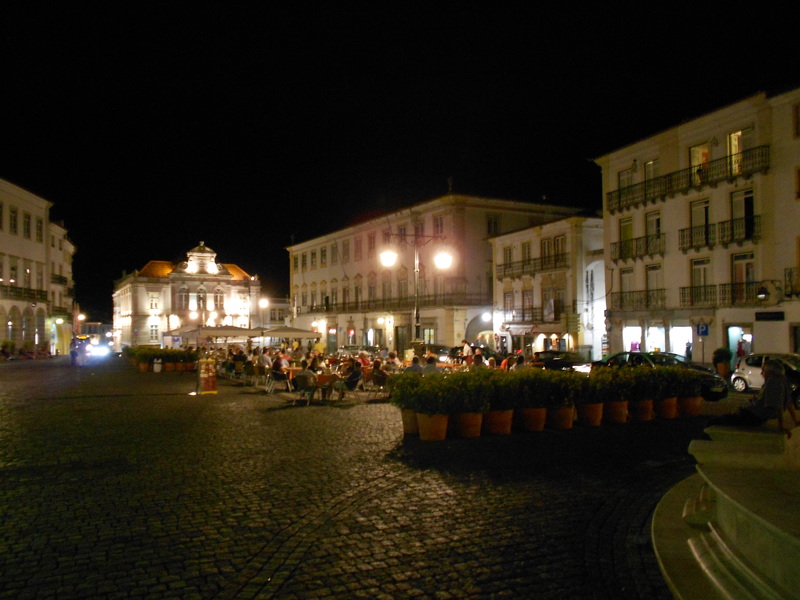 We spent a fortnight over there in September 2013 and were quite relaxed, chilled and contented as we sat on the terrace seats of a bar overlooking Lisbon just 24 hours after I’d done my last shift for the employers I’d fired a couple of weeks beforehand. We’d like to head over to Switzerland too, but do it by train rather than by air. Idea is to put a tent up at Interlaken and then explore from there. I did this in the 1980’s, but want to do it again, just for the hell of it. The combination of scenery, cities and the Swiss railway system make it all possible – even if the journey through the Eiger is still one of the most expensive rail journeys in Europe. I suspect that I did it before Michael Portillo (I stand to be corrected on this! ), but hey, it’s worth doing it again, even though my wings have been clipped a bit. Other destinations to revisit include Cyprus, the Jura, Andalucia, Ireland and Austria. Some destinations are worth being a tourist for, others as a walker. Orkney in good weather would be another one on the list too as it poured down the last time we were up there. New ones on the list would be crossing the States by train and then spending some time in New England in the fall (corny I know, but one to try out), journeying to the Greek Islands, cycling in the Netherlands, touring Italy and taking a week or two to explore Sicily. Yes, the last ones are inspired by TV programmes – Francesco Da Mosca‘s journey by Alfa Romeo and Inspector Montalbano respectively – but they fairly and squarely hit the spot. And after all, it wouldn’t be the first time that we’ve travelled after television provided the inspiration. We watched Julia Bradbury’s Icelandic Walk programme one Saturday night and discussed it the following day. Whilst we couldn’t afford to hit Iceland on the break that we had six weeks later, we did a bit of probing and got reasonably priced flights to Oslo instead. Would we go back again? We’d have got the next plane out if we’d had the money and the time off – only problem was that we’d spent up on our ten days over there. £8 for a beer and £43 for two pizzas and two soft drinks in a place in Oslo kind of hit our combined spending power somewhat! So, how light is too light? Well, there are no rules to answer this question, because everybody has their own variation on the theme. Another factor to consider is how fit for purpose an item is – I know that a particular jacket has lasted me a while now, but I’ve also had comments about a similar jacket lasting one day (but that was on an ascent of Eiger by one of the best climbers in the UK…). Everything that’s packed reflects practicalities and the surroundings we’re encountering. If Caroline’s hiring a bike during the trip, then she’s usually packed her biking clothes as they are multi-purpose items. There may be smart stuff in the bags or there may be rugged stuff, or a combination of the two that can be mixed and matched. What we haven’t done is go down the ultra, ultralight route when it comes to our clothing or footwear choices. The kit is light, but not too light because I’ve had first hand experience of kit that was quite simply too light to be useful. I’ve had two occasions when trouser fabrics have failed on their first or second outings. In one case, I’d put the trousers on straight from the bag and then kneeled down to lace up my shoes. The second occasion was on another pair of trouser’s second outing – a four hour walk in the Wicklow Mountains over mild terrain with no stiles or walls to climb. The trouser fabric had worn through on the inside of both thighs, leaving holes in the trousers that were quite visible to all and sundry. Both sets of trousers were pre-production models, one from a small manufacturer and the other from a quite well respected one. Both companies were informed of what happened and in both cases, the garments were pulled from the respective ranges without ever reaching the shops. I’ve had similar problems with footwear in the past, but like the trousers mentioned above, such problems have typically occurred on pre-production samples sent out to the press or company testers for appraisal and feedback. In one case, the shoes were really comfortable and great in dry conditions, but when it rained, grip levels simply disappeared. One pair of shoes wore through on the heel lining whilst one pair of boots were great on grass or soft surfaces, but when I hit the stony path that led back into Ambleside, I could feel every stone that was under the sole of those boots. On production models, such things are a rare occurrence as if there’s a problem with any kind of product, the journalist or company tester will contact the brand in order to ask for their comments and incorporate the feedback into any reviews that appear in the press or whatever. It’s not in a brand’s interest to put out kit that isn’t up to scratch as sales can suffer and the brand’s name can be tarnished in the eyes of the customer or, more importantly, the potential customer. It’s one of the reasons why I don’t go for the lightest or the newest kit on the market. I prefer to have items which combine lightness with good longevity potential and buy items which have been around for a while rather than rushing straight in to buy the latest pieces of kit. If a product has been around for a while and has just undergone colour changes, then it’s usually a good sign that the item is sound, sorted and more than fit for purpose. Take a look at gear forums on a few different sites and see what the user comments are about a specific item or ask questions yourself about a particular product that you’re interested in. There may be trolls around, but most posters on such sites will give honest opinions on products they’ve bought and used in anger. Use the information gleaned from the sites and magazine reviews and make your mind up. Pay attention to any comments about the longevity of the products that are mentioned – are they still fit for purpose or have there been any problems? And try to buy from a bricks & mortar shop too rather than online as you should be able to pick the brains of the salesperson as to whether the item is fit for purpose and if they’ve had any problems with it. So then, how light is too light? We’re content to travel on hand luggage wherever we go to now. Others need a bit more, others need a bit less. Caroline and I have both checked into four or five star hotels with minimal luggage – i.e. the kind of outdoor briefcase made by Haglofs or Vango – containing just what we needed for an overnight stay. Basically it was one change of clothing each, toothbrush and toothpaste, deodorants, a comb each and our respective talk and text phones. No Kindles, no computers, no tablets and no smartphones. Why because it was five years ago and apart from my Apple iBook that I’d left at home, we didn’t have any of the other tech items I’ve mentioned in that last sentence. Did it bother either of us? No. Did we conform to the dress codes of the respective hotels we stayed in? Oh yes, and we were both smarter than some of the golfers staying in one hotel when we hit our respective tables in the dining room. I remember reading a piece in the CTC (Cycle Touring Club) magazine a few years ago about the strategies used by several cyclists when they went off touring. One pair got their kit for a two week ride down to what could fit into two bottle cages for everything they needed for the trip. Now that is travelling light, but I have recently heard of someone who goes one better than that. The person in question carries a bare minimum of stuff whilst travelling. If they’re heading towards relative’s houses then there’s a chance that there’s a change of clothing there. If they have heading to friends houses, then it’s been alleged that they have tried to borrow a change of clothing for the night or whatever – including underwear! What I don’t know is how many times they have been told to ‘Sod off’ and had to go commando, but I have heard that there may have been occasions when pants have gone in the bin rather than the washing machine once the visit’s over!